Some couples are wary of signing a premarital agreement before getting married. You might be hesitant to even discuss the idea. But a premarital (also called prenuptial) agreement is not your only chance to protect your financial future. What Is the Difference between a Premarital and Postmarital Agreement? This might seem like an obvious question, but if you’re unfamiliar with prenups then you might need a little clarification. The main difference between a premarital and postmarital agreement is when you created it. If the agreement is created and signed before the wedding, it’s a premarital agreement. If it’s created and signed after the wedding, it’s a postmarital agreement. Both documents are legally enforceable. Why Do I Need a Postmarital Agreement? A postmarital agreement is a written agreement between spouses that outlines each party’s property rights and obligations. It takes effect when it is signed and, like a prenup, contemplates how property will be divided in case of divorce. It might also discuss how property should be handled during the marriage. For example, a postmarital agreement might discuss each spouse’s right to manage and control marital assets, and whether one spouse will receive spousal support if the couple divorces. (Child support and custody issues are decided during divorce proceedings, and cannot be included in a postmarital or premarital agreement. Courts resolve these issues based on the best interests of the child). One spouse receives a large inheritance, which is not marital property. She wants to make sure it doesn’t get mixed up with marital funds. 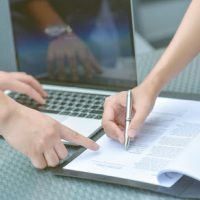 A postmarital agreement can help distinguish between property jointly owned by the couple and individual property owned by each respective spouse. One spouse opens a business and wants to protect those assets in case the marriage doesn’t work out. He wants to make sure his business will continue and thrive even after a divorce. A postmarital agreement can hammer out those details. If the couple is bad at financial planning, they can use a postmarital agreement to clarify how marital assets are divided and who is responsible for paying the bills. You can also use a postmarital agreement to plan for the future. For example, if one spouse is diagnosed with a serious illness or becomes disabled, a postmarital agreement can deal with the related property and financial issues. Is My Postmarital Agreement Enforceable? A postmarital agreement is a contract, so it’s only enforceable if it complies with Florida law. It is not binding if one spouse coerced the other into signing it or if it is extremely one-sided in favor of one spouse. The Florida family law attorneys at the HVW Law Group can help you negotiate an equitable postmarital agreement with your spouse, enforce an existing agreement, or contest an unconscionable or other invalid agreement. Contact us today for a free consultation. We are eager to assist you throughout each step of your case.